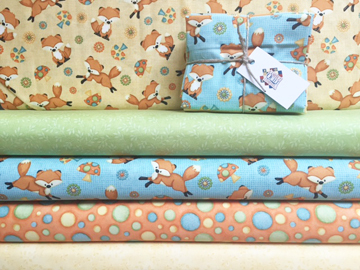 The Quiltzette: Food Drive, Foxy Fabric, Fun Classes . . . and More! The Good Samaritan Center received lots of donations for their food pantry over the holidays, which was great. But now the shelves need to be refilled. Let's help. 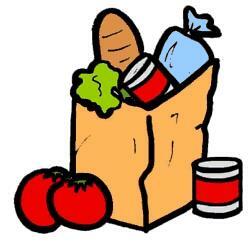 Bring non-perishable food items for donation to Cortez Quilt Company from now through February 15. What the pantry needs the most: canned veggies, canned soups, canned beans, dried beans, tuna, spaghetti, and peanut butter. For each one of these seven items you donate you'll be entered into a drawing to win a $50 gift certificate to the shop. For example, if you bring in two jars of peanut butter and three cans of beans, your name will go into the drawing five times. Any and all non-perishable, non-expired food items are welcome. 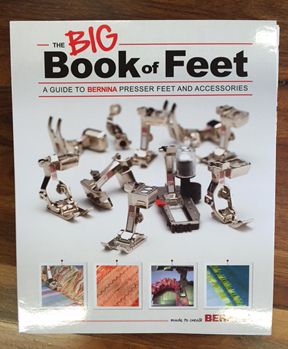 This cute children's collection arrived last week. Happy little foxes and coordinates. Thanks to Tobie Baker from The (Cortez) Journal for visiting our shop last week and writing this nice article about our Youth Classes. Read it here. 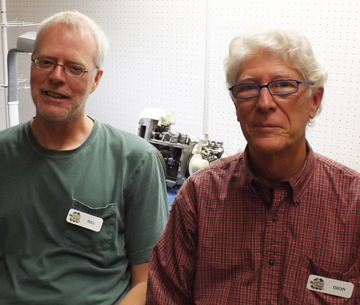 Bill and Dion are pretty caught up right now so if your machine is due for its annual service or needs to be repaired, bring it in this week. Turnaround time is typically 5-7 days unless the techs have to order parts. We also offer Same Day Service by appointment for out-of-town customers. Get more details here. Upcoming Classes: It's All About the Bags! These handy bags for stow and go stand open for easy access. With Lazy Girl’s One-Zip technique, cut a zipper apart, take off the pull, then stitch one side of the zipper in straight and flat. To finish, bring the ends together and use Joan’s easy trick to put the zipper pull back on. Add easy grab tabs from leftover zipper bits. Judy Bryan will teach this class. 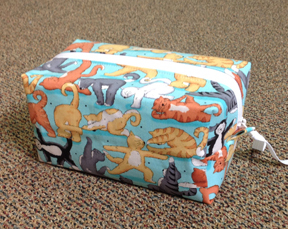 Make this cute little zippered duffle in an afternoon with Judy Bryan as your guide. 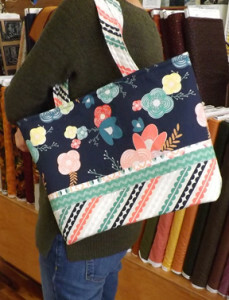 The pattern offers several different sizes and you’ll have the option to line the bag with iron-on vinyl if you’d like. 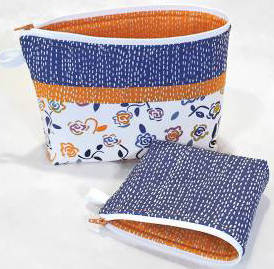 These are great for storing cosmetics, power cords, sewing supplies, and just about anything else. 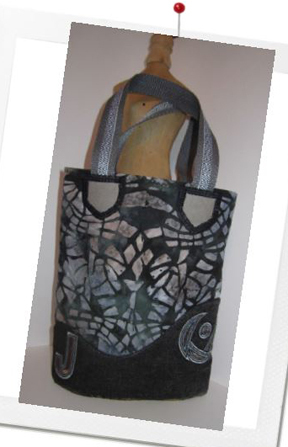 Judy Bryan will teach the Tuscany Tote on Saturday, February 6. This class is perfect for anyone who has never made a bag or tote. It has no zippers or hardware but lots of great pockets on the inside. Plan to leave this class with a completed bag. 1 p.m. or 6 p.m. Please register as soon as possible by calling Cortez Quilt Company at 970-565-7541 or by sending an email to Cindy and indicate which session you would like to attend (1 p.m. or 6 p.m.). Bring your laptop loaded with Software 7, a USB stick to get a copy of the design of the month, and show and tell embroidered items for additional chances to win a door prize. Join us just for the 30 minute video presentation, or stay and create the design. Congratulations to Barb Haynie who won our first Block Lotto of 2016. She's taking home 17 blocks to turn into a beautiful quilt . . . just as soon as she can get out of her driveway and come to the shop to pick them up! 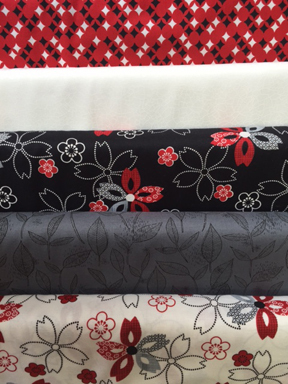 Here's the fabric selection for February Block Lotto. 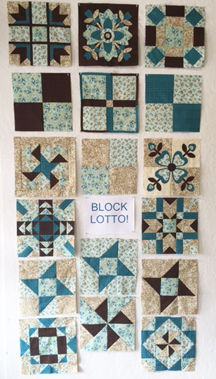 Pick up your fabric packet this week and return two finished blocks by February 29 for a chance to win. 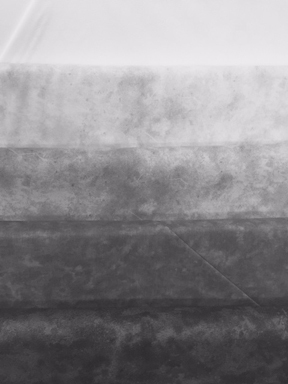 Tip of the Week: Enough Contrast? 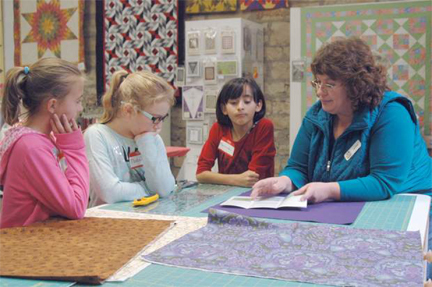 When choosing fabric for a quilt, contrast often comes into play with "is there enough?" being the operative question. You can ask for opinions if you're at the shop, but what about when you're home alone about to cut into your precious stash? One option is to lay out your possible fabric choices, stand back a bit, and squint at them. This sounds a little silly, but it actually works. Or, you can use your phone to take a photo using the tonal setting. That's what we did here. See the difference? 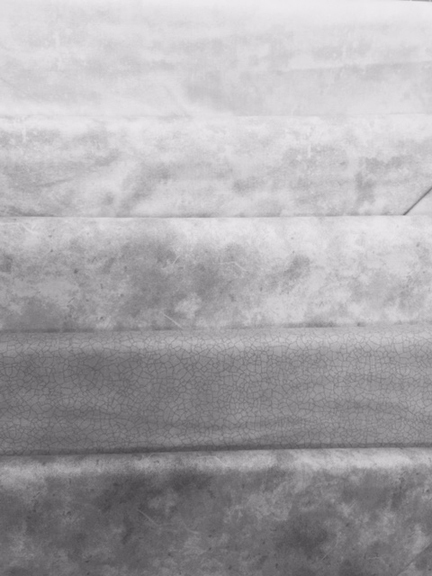 There is more contrast - light to dark - in the second group of fabrics. Both of these sets were varying shades of blue with one white added to this one . . . for contrast, of course!